Bio-tiful Dairy produces uniquely versatile and healthy dairy drinks made with Riverford Dairy organic milk and authentic, centuries-old recipes for Kefir and Riazhenka. We were asked by founder Natasha Bowes to redesign the packaging to evoke the pure, natural health benefits of the drinks. 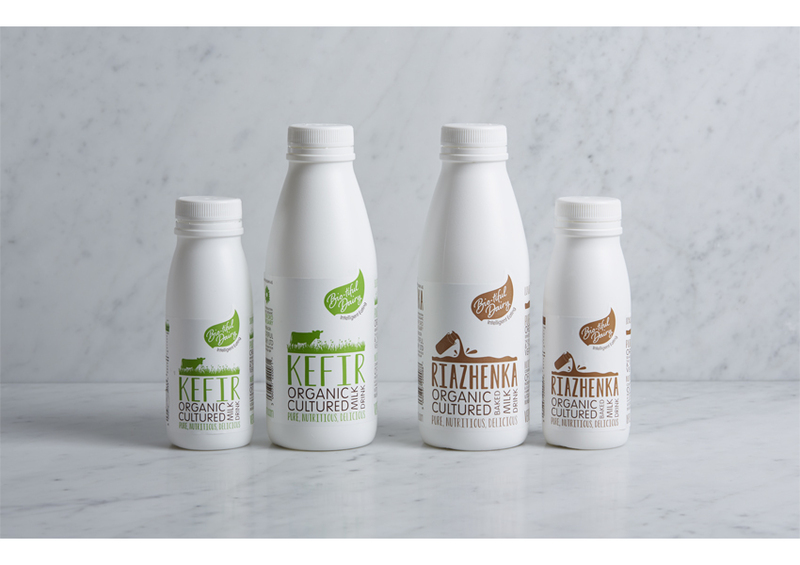 The dairy was set up in the UK to create the delicious organic cultured milk drinks; Kefir and Riazhenka, widely consumed in Russia and Eastern Europe. The beauty of these drinks is that they are so pure, authentic and nutritious, which we felt wasn’t reflected completely in the current packaging. Our solution was to create a label that incorporated friendly handwritten typography and illustrations, reminiscent of old milk bottle labels, bringing to mind wholesome imagery of dairies. Bio-tiful Dairy produces uniquely versatile and healthy dairy drinks made with Riverford Dairy organic milk and authentic, centuries-old recipes for Kefir and Riazhenka. We were asked by founder Natasha Bowes to redesign the packaging to evoke the pure, natural health benefits of the drinks. The dairy was set up in the UK to create the delicious organic cultured milk drinks; Kefir and Riazhenka, widely consumed in Russia and Eastern Europe. The beauty of these drinks is that they are so pure, authentic and nutritious, which we felt wasn’t reflected completely in the current packaging. Our solution was to create a label that incorporated friendly handwritten typography and illustrations, reminiscent of old milk bottle labels, bringing to mind wholesome imagery of dairies.